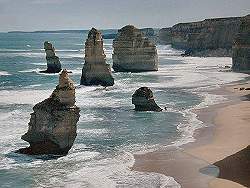 Image: The Twelve Apostles, twelve characteristic island rocks. Location: West of Melburn, along the coast near Port Campbell. 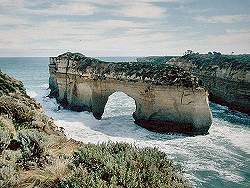 1964 Port Campbell National Park was dedicated. 1981 Port Campbell National Park grew to its current size of 1750 ha. 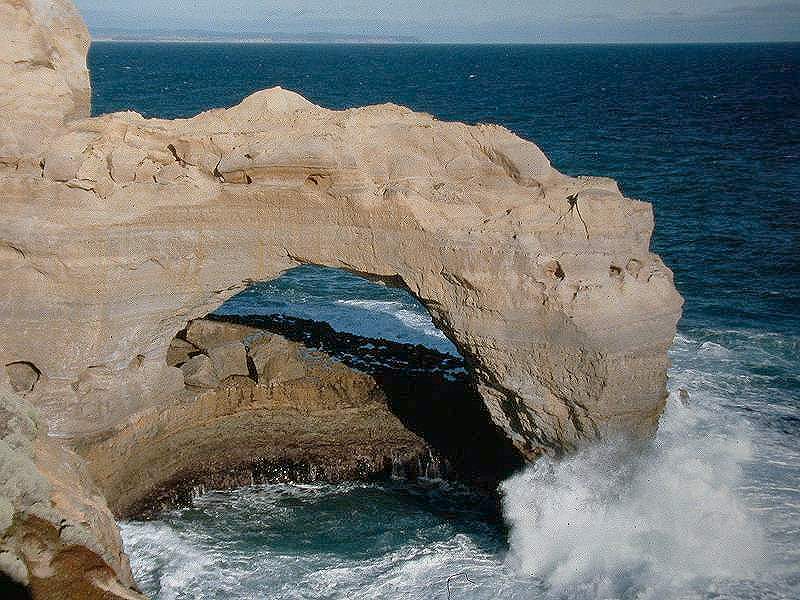 Image: a natural bridge in an island. Along the coast between Melbourne and Port Campbell, the Great Ocean Road, one of the most scenic routes of the world, allows the visitor to follow the coastline. Sheer cliffs, offshore islets, towering rock stacks, gorges, arches, blowholes and sea caves. The coastline is formed by a soft Pliocene limestone with karst features. Above sea-level the limestone is exposed to violent seas and strong winds which have carved out some remarkable features. So many interesting structures are formed by a combination of marine erosion and karst mechanisms. The Twelve Apostles, twelve characteristic island rocks. 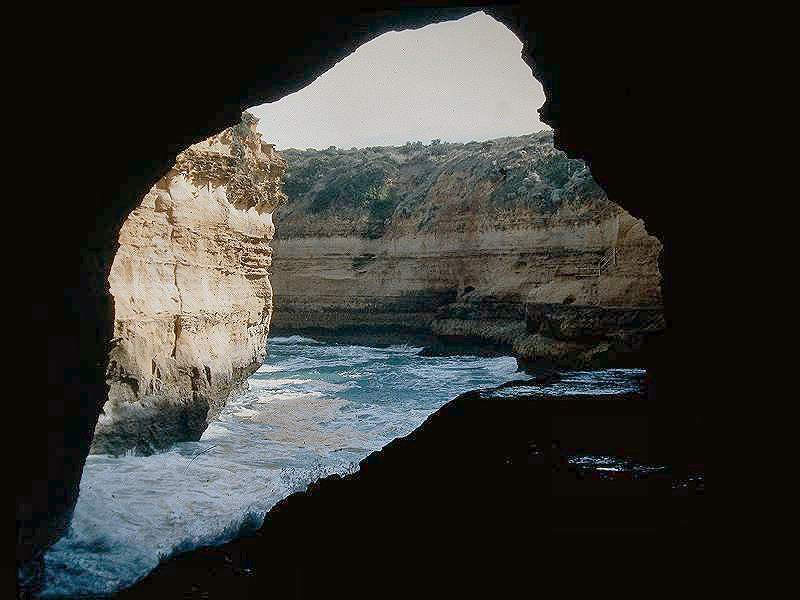 Two small caves are located in Loch Ard Gorge, which was named after the iron clipper Loch Ard after it hit the cliffs just in front of the gorge in June 1878. The caves served as shelter for the two survivers Eva Carmichael and Tom Pearce and are named Carmichael Cave and Tom Pearce's Cave. Today there is a geological trail explainig the background of the cave, a blowhole and other interesting features. Not far from Loch Ard lies the Thunder Cave. Despite the name, this is not a cave, it is actually a roofless cave, which collapsed long ago by the ongoing erosional forces of the sea. The plate at this location show a scetch how the cave must have looked when still a part of the ceiling existed and formed a natural arch. 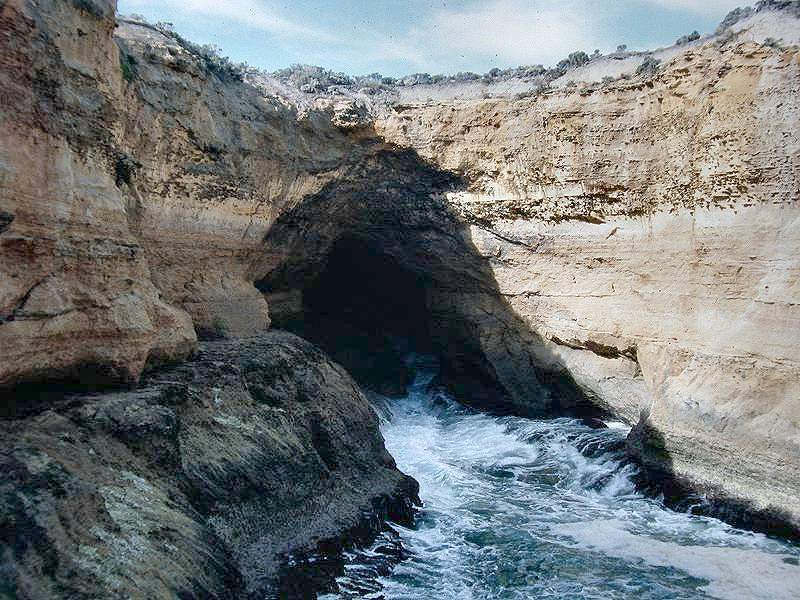 Another interesting geologic formation is the Grotto, a sink hole alterated by the forces of the sea. The place is rather strange, with natural bridges and seawater pools. And last but not least, the natural bridges of The Arch and London Bridge are cave related feastures, a certain form of sea caves. Search Google for "Great Ocean Road"